Welshman Elfyn Evans finished 21st as Belgium driver Thierry Neuville won the fourth round of the World Rally Championship in Corsica. Evans, 28, experienced hydraulic problems on the second stage and dropped two minutes. Alongside co-driver Daniel Barritt the Dolgellau-based Evans crashed on day two and dropped down the standings. 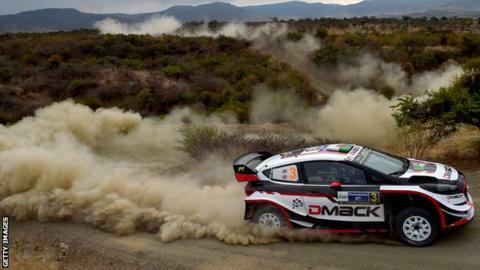 His team were able to repair the DMACK M-Sport Ford Fiesta, and the pair completed the event. Evans made a return to the top class in January 2017 after a 12-month absence, and is currently ninth in the overall standings. Reigning champion, Sebastian Ogier ended the rally on the podium in second place. Third position in the Tour de Corse went to Hyundai's Dani Sordo. British driver Kris Meeke was leading after five stages but was forced to retire after suffering engine problems on stage six. The fifth round of the WRC is in Argentina on 27 April.